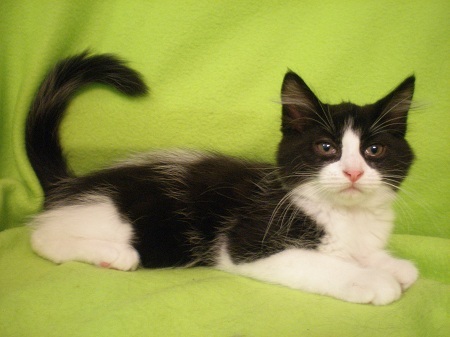 My name is Toshi and I am one of the sweetest kittens ever! Judging from the wild streak of fur on my back, I will grow up to have a long coat. (It’s a good thing I like being brushed!). I am friendly, easygoing, confident, and like to cuddle. And I’m a talker, especially when the wet food is being served up! Sometimes I do the “silent meow”, just to make sure I steal your heart completely. I really like the adult cats and small dog in my foster home, (plus all of my siblings, of course). I know what the litter box and scratching posts are for, and play gently with human hands. I ride well in the car, and adapt to new situations easily. I have gone to work with my foster mom a couple of times and, after running laps around the offices, took a nap in her Inbox. How crazy adorable is that? If you’re looking to bring some “adorable” into your life, I’m your man! I am 10 weeks old, fixed, vaccinated and microchipped. My adoption fee is $135.